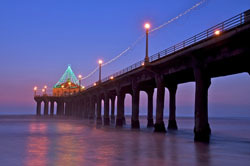 Manhattan Beach’s 19th Holiday Open House and 24th Annual Pier Lighting is today from 6:00-9:30pm. The event takes place every year in downtown Manhattan Beach, California. To kick off the holiday season, local shops and restaurants open their doors to thousands of locals that come down to get an early dose of Holiday cheer. Carolers and music will fill the streets as the countdown to the lighting begins. Lots of local merchants will be offering discounts and special offers tonight as they prepare for the holidays. Mayor David Lesser will switch on the pier lights at 7:00pm and the celebration will continue until 9:00pm. Santa will be at the Bank of America parking lot greeting neighborhood kids. Metlox Plaza will also have live entertainment until 8:00pm. Tonight’s the perfect opportunity to start off the holiday season with the kids and extended family. Grab your friends and head into Downtown Manhattan Beach. If you’re driving, please note that Manhattan Avenue will be closed from 9th Street to Manhattan Beach Boulevard between 4:00pm and 10:30pm. And Manhattan Beach Boulevard will be closed from Ocean Drive to the Strand between 5:00pm and 10:30pm.